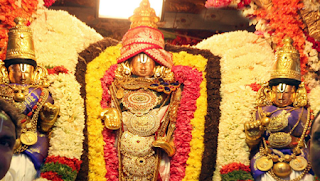 Sri Venkateswara Swamy is in Venkatadri Hill(one of the Seven Hills) in Tirumala. Inside the temple there is a Garbha Griha where the Idol of Lord Sri Venkateswara Swamy is placed. The idol stands majestically in the Garbha Griha directly beneath a glit-gome calles the Ananda Nilaya Divya Vimana. This idol called the Mulaberam(Mula Virat) and is believed to be Self-Manifested. According to the available Temple inscriptions, Sri Venkateswara Swamy Temple was maintained and developed by various kingdoms in the past. Of them the Pallavas of Kachipuram(9th Century),the Cholas of Tanjore(10th Century) and Vijayanagara Emperors(13th,14th and 15th Centuries) are more prominent and all were great devotees of Lord Venkateswara. 13th/14th/15th Centuries: During the regime of the Vijayanagara Emperors, Ananda Nilaya Divya Vimana was covered with glit Copper Plates and covered with Golden Vase by one of the Emperor known as Yadava Raya in the 13th Century. In 1517,Sri Krishnadevaraya on one of his many visits to the Sri Venkateswara Temple, donates enormous Gold and Jewels. The Maratha General Raghoji Bhonsole set up a permanent administration for the conduct of worship in the Sri Venkateswara Temple in Tirumala.The rulers of Mysore and Gadwal endowed large benefactions to the temple. 17th Century: Lala Khemarumu is a Kshatriya known as Raja Todaramallu, courageously protected Tirumala both from the invasions of Muslims and the British during 17th Century. 18th Century: In 1843,with the invasion of the East-India Company, the administartion of the Sri Venkateswara Temple and a number of Shrines was entrusted to Seva Dossji of the Hathiramji Mutt. The Seva Dossjis were the Vicaranakartas(Managers) for nearly a century until 1932. 19th Century: In 1932,Tirumala Tirupati Devastanams TTD was established with the powers of Administration and then onwards TTD Act,1932 came into effect and continuing till today. Alwars,Ramauja(Father of Vaishnava Community and Architect of Tirupati),Sri Tallapaka Annamacharya(14thcentury),TarigondaVengamamba(17th century), Tyagaraja, Purandardasa, Kakarla Tyagabrahmam and many great saints got inspiration and salvation from Sri Venkateswara Swamy.